There is an older, fainter supernova remnant in Cygnus and it lies just up from the double star Albireo. 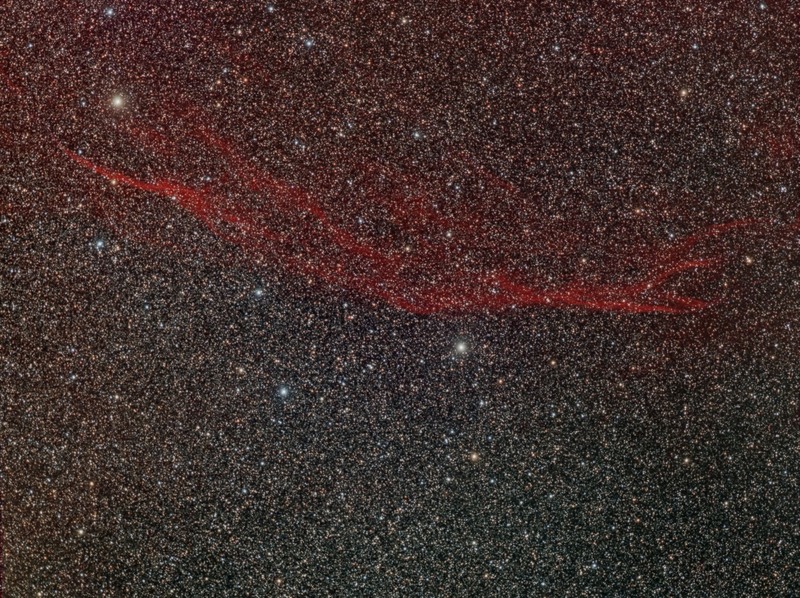 At about 30000 years old (Veil 7500 years) and further away 2500 ly (Veil 1500 ly) it is correspondingly fainter. The part I’ve imaged here has the designation Sh2-91. I last took pictures of this object back in 2014 with my QHY9 colour camera and it wasn’t entirely prominent but by combining the old data with 4 hours shot through my new Baader 3.5nm Ha filter a more distinctive image is formed. I’ve rejected some of the original frames that had some thin cloud and re-stacked, then registered the new Ha frames and combined using the Pixinsight NBRGBCombination script.